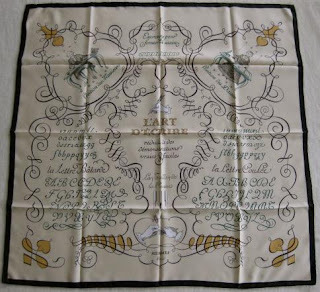 It's certainly been a long time since a scarf design managed to take my breath away - until tonight, when, in search of inspiration for something spectacularly different, I came across "L'Art d'écrire" ("the art of writing"). Having an absolute passion for writing instruments, this design resonated with me instantly. The irony is that while I haven't been gifted with a beautiful penmanship, I am the first to admire a beautiful writing style. Or, perhaps, it is exactly because I don't possess it that I admire it whenever I see it. Or, better yet, because the art is so rare to come by, it's all the more precious. Either way, I feel a certain harmony and pure beauty exuding from the artistically crafted letters, their shapes, winding on the paper like paths through the valley conjured by mountains, enchanting the eye as do the sounds of violin in the intimacy of a private room. The path each letter draws is an invitation to discovery, to adventure, to beauty and to higher learning. Their music render a symphony to those inclined and willing to listen. 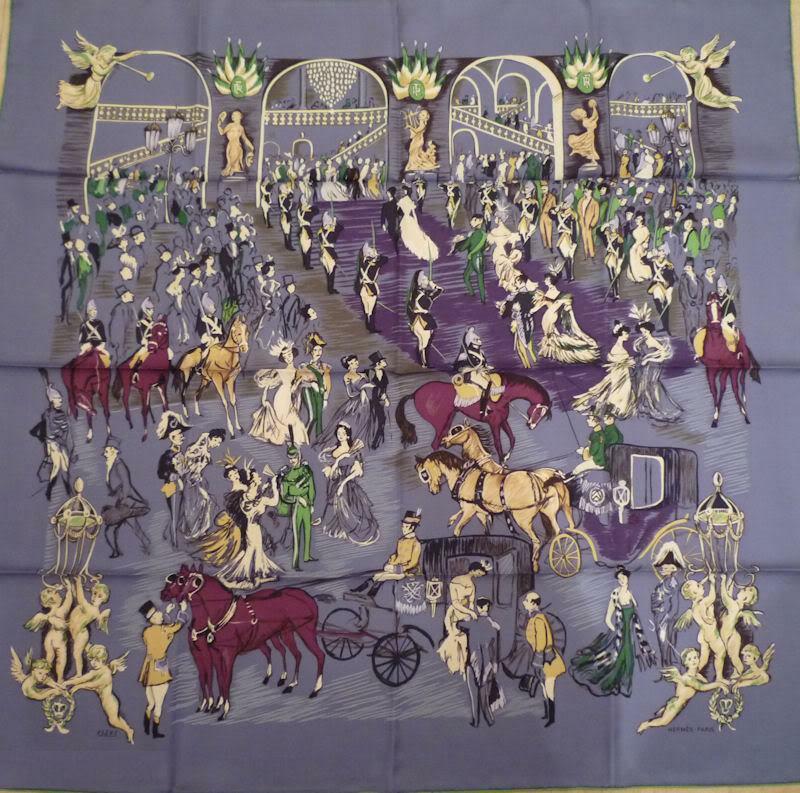 Released in 1957 and reissued in 1999 in moussline and in 2005 in silk, this scarf is as contemporary today as it was half a century ago, particularly in pastel colours. Its timelessness is likely due to the art of writing, which continues to fascinate people all over the world, who embrace it actively and instill its sense of beauty in the future generations. 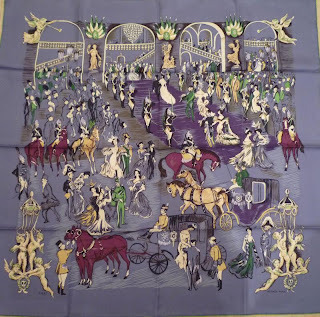 This week I continued my exploration of the City of London, and while the museums were great and the food tasty, the epitome of the culture I found at the Royal Opera House, at Covent Garden. It was by chance that I had such an incredible experience. Not only have I been lucky to come across the tickets, but also, for the big opera aficionado that I am, I got to see Rigoletto, one of my all-time favourite operas. Needless to say, the experience was truly unforgettable, and not as much for the venue where the artists performed, as for the staging. The sheer number of singers provided both an insight into what the court of an Italian Duke would have likely looked like, and a depth to the performance (voice-wise) unmatched in many a performance. "Soirée de Gala" ("Gala Party") is a rendition of the scene (read: commotion) in front of the (old) Opera House in Paris (Opera Garnier) with an arriving patron descending from a coach, other greeting and exchanging pleasantries on the steps of the imposing building, richly ornate to match the grandeur of the upcoming spectacle. Issued originally in 1950, this design was recently relaunched in 2006 and, more recently, as part of the Fall/Winter 2010 collection. Jean-Louis Clerc, the artist behind this rendition, created other designs for the Maison, such as Armenonville (of 1961) where his "signature" style is obvious. 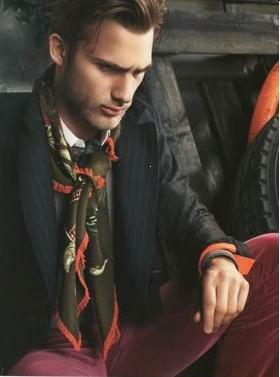 For added excitement, I'm attaching below a picture featured by Hermes in its fashion magazine. 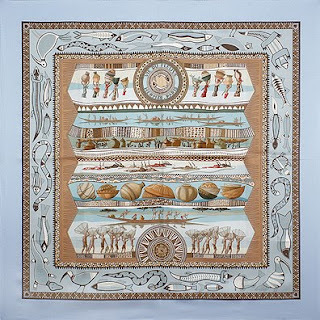 The scarf depicted in the picture is of cashmere, with fringes - a beautiful scarf that can be decidedly unisex with the right accessories (such as a pair of masculine boots, or possibly a "rough"-looking beard). Having just arrived in London, I embarked, on short order, on a voyage of discovery inside the British Museum, not least to experience Norman Foster's creation in the Great Court, the glass-enclosed ceiling covering the old garden, now transformed in the largest square in Europe. But the highlights continue to be the Rosetta Stone, the engraved text of which provided the key to deciphering the Egyptian hieroglyphs, as well as the other Egyptian, Asyrian and Greek artifacts (such as the Elgin marbles). Issued in 2003, "Tresors du Nil" ("Nile Treasures") opens a fascinating window into the ancient Egyptian civilization, as we know it today from such artifacts and texts. 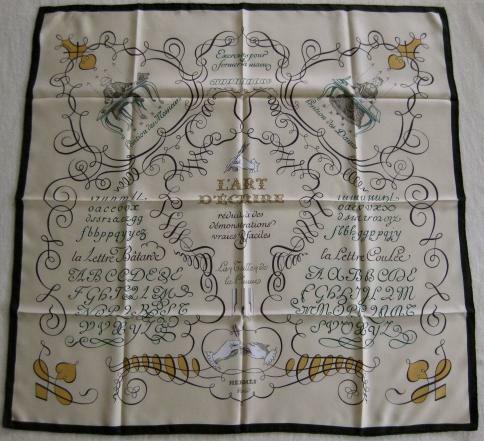 This scarf, just like the visit to the Museum, is spectacular not as much for what it displays, but for what it allows us to imagine. Perhaps that is one of the most tremendous legacy such values - both cultural and philosophical - have succeeded in leaving behind. The colour combination - particularly the crispiness of white silk's shine against the dark brown - is equally spectacular. Although the pattern along the scarf's edge may be traditional but I'd like to think that the pattern, just like the treasures of the river Nile, are timeless. 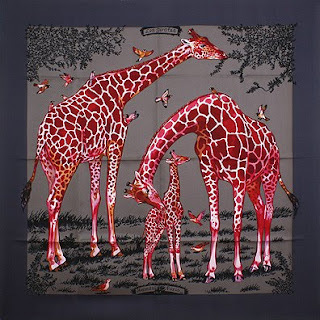 And it's precisely because of its timelessness that this scarf can be sported by guys alike - although, if one might be concerned about the item's association with femininity, he could balance it with a pair of more rugged boots (an item distinctly masculine).